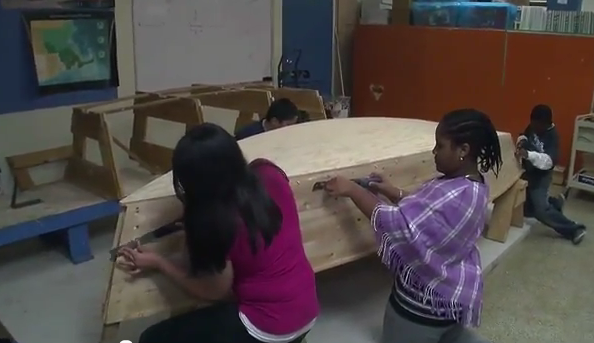 These are 10ft flat bottom skiffs built by 5th graders at the Dennis Haley Elementary School in Boston. Materials are: 3/8″ fir, marine ply bottom, white oak stem, frames, knees, rails and keelson, old growth eastern pine planking, silicone bronze fastened. These are the boats launched in June 2011. A new set of 8 boats built this past school year will be launched June 8, 2012.